History reminds us the $700B bailout will cause irremediable inflation. As the US house of representatives voted to increase the dollar supply by $700B, many are wondering what effect this will have on energy prices. 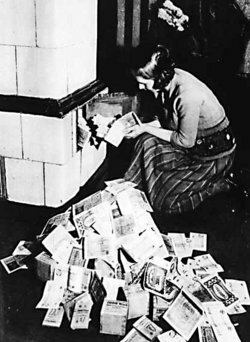 Crushed by World War One's debt, the Weimar republic kept printing money and giving it directly to consumers and businesses to buy votes and help them cope with ever increasing prices. Within a few years the Mark had devaluated so much that a postage stamp cost fifty billion Mark and everyone's life savings had been wiped out. Mark bills were worth less than the paper they were printed on. As the famous picture above illustrates, in the face of galloping energy prices, it had become cheaper to heat one's house by burning money than coal. Although one US dollar is still worth more than the paper it is printed on, as of 2008 one US penny contains 2 cents worth of metal. Although oil prices seem high today, they are kept artificially low because many oil-producing nations such as Saudi Arabia peg their currencies to the US dollar. When the dollar is devaluated, these countries currencies and national economies are threatened by inflation and this is an incentive for them to let their currencies float and appreciate. In 2006 Kuwait unpegged its currency from the US dollar and as other oil-producing nations follow suit, expect energy prices to rise. Currently oil is bought and sold on the world market in dollars, so everyone needs to first buy dollars in order to buy oil. We have reported on a trend for oil-producing countries to sell oil in Euros instead of Dollars. As more oil-producing nations fear the dollar is becoming "funny money" and demand payment in Euros, the world's need for Dollars will be greatly reduced. This is basic supply/demand economics. Simply put, the average American household is already too much in debt and this scares banks from lending any money. Giving $700B to these banks will not change the fact that lending to bad debtors is a risky venture. It is safer for banks to invest this money in commodities (oil and gold) which do keep up with inflation than to issue loans that cannot be repaid. So expect this bailout package to give a speculative boost to oil prices.